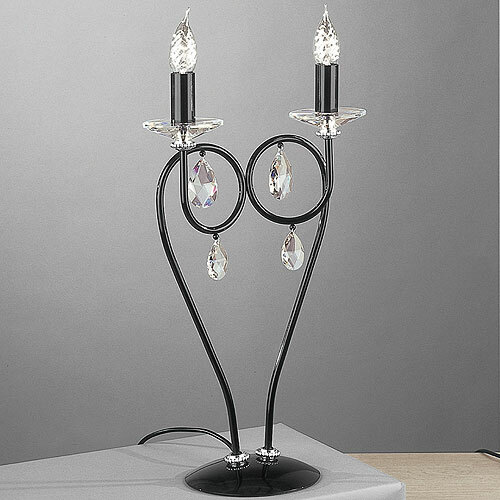 J H Miller Alejandra 2 Arm Table Light Black has a shiny black finish with chrome details and elegantly finished with Spectra Swarovski lead crystals. This Alejandra has 2 lighting arms and comes ready assembled for installation. Shown with 60W SES bulbs that are not included with the wall light. Due to the hand-made nature of the products, the goods supplied may vary in detail from the illustration and description given. Colour finishes will be maintained as accurately as possible, but an identical match can not be guaranteed. The manufacturer will make good or replace at their works without charge any goods which are in the manufacturers opinion defective. The claim must be made within a reasonable period of time after the defect has been discovered. No responsibility can be accepted for defective material after the same has been cut of manipulated.